The military sabre is a much heavier weapon than modern fencing sabres, which have more in common with the duelling sabre favoured in the late 19th century in some quarters. Even those are much heavier than modern sporting weapons, requiring a more traditional body of technique. 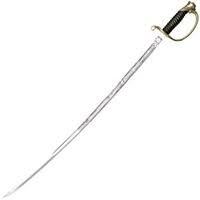 The sabre is primarily a cutting weapon, although the point thrust can be used with great effectiveness upon occasion. Parries are a little wider than would be used against, say, a smallsword thrust, to absorb the impact of a blow. That is not to say that a sabre match is a study in uncontrolled swinging. Quite the opposite - control wins fights. The key to sabre fencing is to keep the shell guard 'in the box', i.e. within the roughly rectangular space in front of the fencer. If the guard is in the box, the blade can be moved to defend using relatively small lateral or rolling/circular motions, and cuts can be made without uncovering the fencer's own body. Wild swings will either result in being hit with a thrust on the wind-up, or the opponent making an easy parry and then landing a disciplined cut of his own before retiring 'covered' to allow it to take effect. There repertoire of possible movements with the sabre is relatively small compared to some weapons, though the subtlety possible within that body of technique is impressive. The use of timing and distance is vital, along with a measure of deception to draw the opponent into making the wrong parry or committing to an attack that will fail and leave him open to a counter. Many different designs of military sabre have existed. Most, but by no means all, were designed primarily for cutting. One common feature is the relatively simple handguard, which might be fairly large and cover much of the hand, or might be quite narrow with a stirrup type knuckle bow. The duelling sabre is straight and lighter than a military model. By no means all sabre duels were fought with duelling sabres; this was merely a design that appeared quite late in the 'sabre era' for that specific purpose.